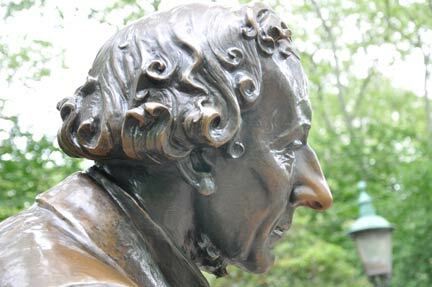 Three generations of New Yorkers have sat at the feet of Hans Christian Andersen listening to his magical tales. In 2015 we celebrated the 210th anniversary of Hans Christian Andersen's birth. 2016 was the 60th year of storytelling at the Hans Christian Andersen Storytelling Center in Central Park. Each year, we make special efforts to establish and maintain an endowment so as to assure the continuation of storytelling at this very special place. or go to Support and make a donation. We would very much appreciate your support. Hon. John L. Loeb, Lennard K. Rambusch, Thomas Della Torre, Anne-Mette Elkjær Andersen, Anders & Yvonne Iversen, Karen Brush, Peter Frederiksen & Eva Jørgensen, Danske Markets, Morten Degnemark, Lynn Carter, Christian Sonne, Danish American Club, Elfie Von Kanzow, Jolyon Stern, Paul Steffensen, Peter Engel. • Donations of more than $5,000 in honor of Diane Wolkstein, who was a storyteller and artistic director for Hans Christian Andersen Story Telling Center for more than 25 years. These donations are dedicated to a special annual storytelling session dedicated in Diane’s memory. • Donations in honor of our former storyteller Kathryn Farnsworth, who passed away in 2014. From the Celebrate Story Fund by Rachel Zucker, $9,580, in honor and memory of Diane Wolkstein, who was a storyteller and artistic director for Hans Christian Andersen Story Telling Center for more than 25 years. Diane was a graduate of Smith College, and had a Master’s degree in education from Bank Street College. She had been telling stories in Central Park since 1967, first as the City’s and Parks Department’s official story teller (1967-1971), and then joining and eventually leading the story telling program at the Hans Christian Andersen statue until she unexpectedly passed away in 2013, while being on a storytelling tour in Taiwan, doing what she loved the most. Diane will be greatly missed by the HCA Story Telling Center, and her loyal fans at the statue. In 2007 we celebrated her 40 year anniversary as a storyteller, at the Arsenal in Central Park. A copy of the speech held in her honor can be accessed here. Her obituary can be accessed here. Hans Christian Andersen Story Telling Center, Inc. is proud and honored to announce that it has been awarded a grant from Travelers Foundation. Travelers Foundation, the charitable arm of Travelers, provided Hans Christian Andersen Story Telling Center, Inc. with an award of $7,500 specially dedicated to conduct story telling training and competitions for children at a New York public school the next three years. Scott Gonge, Conde Nast, and special donations in honor of Angela Engel. Hon. John L. Loeb, Jr.; The Samuel J. 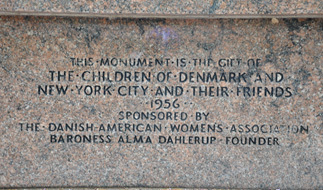 & Ethel LeFrak Charitable Foundation, Inc.; In Memory of Carol and Hans Christian Sonne; Troy Corporation; Starr and Lennard K. Rambusch; Sally and Christian R. Sonne; Scott Gonge; Susanne and Werner Jensen; Paul Steffensen; Erik Norup; Lynn Carter; Ib and Elfi Alvin; Harriet and Lars Nilsen; Viggo Mortensen; Karsten and Lillian Hess; Enid Nemy; Sanna Feirstein; Anne-Mette Andersen; Melva Petersen; Jeffrey Frank; Karen Gianelli; Stig Host; Steve Metzger; C. Nicholas Risom; Jolyon Stern; Julie and Tom Della Torre; VisitDenmark; Hans Christian Andersen 2005 Foundation, Kingdom of Denmark, The Bikuben Foundation; The American-Scandinavian Society; The American-Scandinavian Foundation; The Van Waveren Foundation; Velsor Properties. The Family of Walter LaM Sparry; the LeFrak Family; Susanne and Werner Jensen; Friends of Evelyn Henriksen; the MUPPETS; EXXON Corporation; Christina Elaine from her Father; Friends of Margarita Rudolph; Transamerica Flood Hazard Certification; The American-Scandinavian Society; Scott Gonge; Troy Corporation; Paul Steffensen; Dewitt, Stern; The American-Scandinavian Foundation; In memory of Harry H. Wolkstein from the Harry H. Wolkstein Memorial Fund; three anonymous donations on behalf of the children of Denmark, New York and New Jersey.